I’ve been wanting to for a while, and am finally going to write a blog post about my current Gadget build. I have the screenshot below, and underneath it the deck list. I won’t include my side deck here, even though (or perhaps because) I think it is essential to this deck’s success. You can use your imagination about the side deck might include. Hand traps over Trap cards: Like any Gadget player, I originally played very heavy back row. There is clearly some synergy in that, where you place a little weeny monster on the field that your opponent knows they have to clear, or else they’ll have an Exceed to deal with. But over time I became frustrated with traps, because they’re slow, not searchable*, often awful, awful top decks, extremely vulnerable to destruction (end phase MST, ugh!) and Royal Decree, and sometimes you just plain have the wrong one for the situation. I found that having a solid extra deck that can solve problems, and the ability to use that extra deck at will, to be much preferable. Having no traps makes you very vulnerable, of course. I mitigated this with a heavy hand trap lineup, with Veiler, Maxx, Gorz and Trag. My experience has been that this is not just an adequate to traps, but markedly superior! A properly timed Veiler is a huge deal. I do not use it in an attempt to stop my opponent’s engine, which I, as a Gadget player, realize likely has some redundancy anyway. I save it for when my opponent needs to solve an important problem, be it Gear Gigant X with one more search remaining, a Machina Fortress that they thought they could Honor ARK, or even a defense mode Redox because if they can’t hit over it then I can probably make a rank 4 play the next turn. Maxx “C” is used similarly. I don’t simply use it for a regular +1 unless I’m desperate (which admittedly, does happen on occasion). I use it, again, when I’ve created a problem that my opponent needs to solve. Maxx discourages them from solving it, gives me the ability to possibly stop them (Veiler), and gives me pluses when they really, really don’t want that. It’s a mindfuck and also just plain strategically troublesome when they prepare to make a play with a certain card advantage in mind, but everything they thought was true in life was wrong. Plus Gorz is level 7, and Tragoedia with Gearframe, and the ability to search levels 7, 8 and 10, is a nightmare for synchro decks. * Being able to search Bottomless Trap Hole with the Traptrix searcher isn’t good enough! Gigantes: I love this card so much. I haven’t seen this in any other Gadget deck, ever. It’s big, inherent, good on its own, you can it it multiple times per turn, and besides allowing for rank 4 plays, it on occasion clears a ton of back row. I often side out one of them because it is not good first turn, although I once had someone Solemn Warning it (after I’d banished a Maxx “C”) and was able to then banish the other one in grave. So great. It’s also often a solution to Thunder King Rai Oh, whether they negate the summon, you can crash (and take back row with it!) or simply leave it there for fear of D Prison or Mirror Force, since they have to hit it and lose back row. I once summoned it against a Thunder King and three back row, and after asking if he had a response to summon, I crashed, taking with it BTH, Warning and MST. Sometimes people don’t read it, and sometimes they just figure you’re about to exceed so why not save you answers for that? Redox: It’s stupid broken. Not sure it’s entirely ban worthy, but it really ties the deck together. It’s searchable with Lavalval Chain, it’s good in hand, in grave, and it bounces back between being offensive and defensive. At three it was really broken with Gigantes, but it’s still good now. 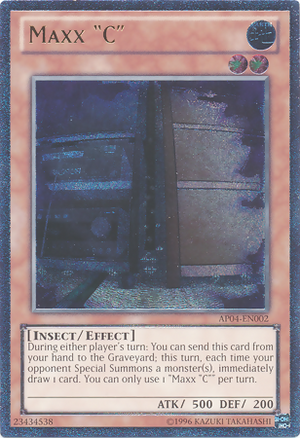 Assuming you have a monster in grave, after summoning a Gadget, you can discard Redox and the just-searched Gadget for cost, target that just-searched card, and then it acts like a Double Summon (though Double Summon is a little better). Redox isn’t a -1 when you do this. The next turn, you can bring it out as a defense, and then use it as a Double Summon again after that. You can also use it to get back Crimson Blader, Machina Fortress, or whatever else. Tin Goldfish: When Redox was at three, I just ran a single Goldfish, but now it’s important to have all three for the rank 4 support. It’s searchable with Gear Gigant X, you can set it against Thunder King in a pinch, and it often baits Veilers from players who are terrible, don’t know about Double Summon, or don’t know about Gigantes. It is vulnerable to Maxx “C” though. Double Summon: This card is often criticized as a -1, as of course Veiler and Book of Moon are too, if you don’t think about their power. There are a whopping twelve monsters in this deck though for which a normal summon is a +1, mitigating the downside of Double Summon very clearly. As mentioned, it also synergizes well with Tin Goldfish being negated, and of course works better with Machina Gearfame than Tin Goldfish does. Again though, I often side out one or two because it’s relatively slow, only being usable once per turn. Redox. Redox at three was a really, really consistent way to get Fortress into the grave with a -1, since I could ditch Redox and Fortress for cost, target a Gadget in grave, and then get a search. That Gadget search was extra, obviously, so not entirely useful, but there were huge upsides to this. The extra gadget add redundancy, making Fiendish Chain, Veiler, etc. unable to ruin the engine. That card in hand makes Trag fatter. You’d rather have it in hand than in the deck. And in a pinch, if you really need to, you can still give up the two Gadgets in hand for Fortress. With triple Redox and Gigantes, Lavalval Chain made getting Redox into hand trivial for this. When Redox became limited, I thought that the deck was dead. I kept playing it though, and realized that between getting Redox by it simply bouncing, or getting a second Gadget (quite likely) it wasn’t too bad. I even sometimes would search Fortress when I already had one in hand, so that their -1 could be combined. I also play Force over three Cannon mostly because I love stealing an opposing Trag, Red Eyes, Ultimate Axon Kicker or any other level 10 on the rare occasion I can, but Force also doesn’t get hit by Deck Devastation Virus and having the diversity makes you less susceptible to Mind Crush. (Oh boy do I love it though when people Mind Crush on Machina Fortress!) I do very rarely summon Cannon with its own effect, but I’ve never wanted to when I only had Force. Never. Daigusto Emeral – A great passive play to replenish resources and regain hand advantage, as well as put back hand traps. I love this card so much. It’s another card your opponent really can’t let you use a second time. I haven’t found that I can often enough make it twice to run two and use a loop. First turn: a typical great first turn is to search Gearframe with Gear Gigant X. You can do so with Double Summon and Tin Goldfish, or even Redox if you’re going second and used a hand trap already. Sometimes you can even Goldfish into Gigant X, search Gearframe, then Double Summon, search again, and defend Gear Gigant X by using the Union effect. When I have Veiler or Maxx in hand, I do this because it creates a problem your opponent needs to solve, as well as thinning the deck of three cards on the first turn (it is only a net +1 though, first turn). If you open with Gear Gigant X and Trag though, I would caution against this unless you know you won’t be seeing synchros (or Red Eyes). I say this because I can’t tell you how many times I made Gear Gigant X, searched Gearframe, and my fearful opponent hit it with Crimson Blader thinking they’d lock me out. When you take the damage, you can drop Trag, then on your turn search Machina Cannon with Gearframe and then use Trag’s effect to steal the Crimson Blader (sometimes then getting to hit your opponent’s monster with it too!). At this point Trag is still 3000 attack and defense, so I usually leave it in defense mode, but sometimes you can hit with it. You can also make a rank 4 with it since it can copy one of the things in grave you used to make Gear Gigant X, and Gearframe is on the field. 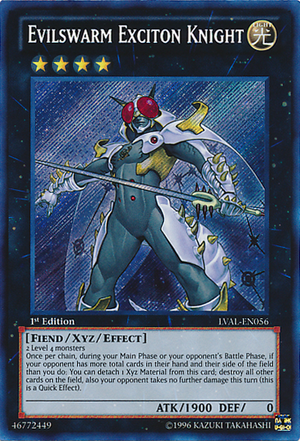 Evilswarm Exciton: This deck tends to maintain serious advantage, but even so you can often abuse this powerful card. Double Summon does not summon the monster when it resolves, it simply allows you to do so later. Because of this, you can -1 with it temporarily, clear the field, then perform that/those normal summon(s) and recoup that loss. Even better than this though is Redox’s effect so get a monster from your own grave. As discussed, although it’s supposed to be a -1 you can break even when summoning a Gadget. Before it resolves though, it is a -2, and since Exciton is a quick effect, you can chain it to Redox! This has the added benefit that anything Exciton destroyed that can, will miss timing. You can also special Redox from grave as a way to cause things to miss timing, or if you’re already at a disadvantage, chain it to Double Summon. Theoretically you can use Fortress or Cannon to -1 to use Exciton, though I’ve never done so, because you commit to the field and then lose it. Exciton works especially well in this deck for two more reasons. (1) There are no traps, so field commitment is what you make of it (which is entirely minimal if you’re smart). And then there’s (2) that sometimes your opponent will set their entire hand to target Machina Fortress! Queen Dragun Djinn: This card is here mostly because if you have Redox in hand and want to make a rank 7 play as well as have a 2200 beater, it’s not always easy or possible. Queen Dragun also negates the monster effect, so Redox will not bounce, which can be useful sometimes as a huge wall. The extra deck also doesn’t run a lot of beaters, and Gear Gigant X is typically used early game to get the engine going. If Maestroke is already on the field, she’s a very safe play as well. Herp derp: This deck has more derp in it than might be expected. 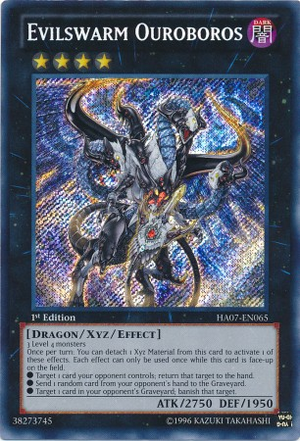 I recently had an Azure Eyes deck drop on me the following: Azure Eyes (the previous turn), Blue Eyes, Red Eyes and Ancient Fairy Dragon, along with a set S/T that I feared. Say what you will about that deck in general, that field is something to be reckoned with! He was trying to OTK, but I had Trag, so he couldn’t. When it came my turn, I cleared his whole field. I start my turn top decking Fortress, and already having a Cannon and a Gearframe in hand. I started by using Trag to steal Ancient Fairy Dragon, discarding Fortress for cost (this time discarding Fortress was even a +1!). 1/5 way there. I then discarded Cannon to summon that Fortress, went Big Eye and took Red Eyes. 2/5 there. Next summoned Gearframe, searched another Cannon, and then Trag copied level 4 so I could Honor ARK the Blue Eyes with Trag and Gearframe. So 3/5 the way there now, controlling Red Eyes, Big Eye and Honor ARK. I then ditched the second Cannon to get Fortress, and crashed Azure Eyes with Fortress, which was a +1 since I could pop the back row (MST here, oh well). I realize that this whole thing could potentially have been stopped, but there’s no way modern trap Gadgets could have done anything like this without Ultimate Offering (which, incidentally, would have gotten MST’d). I’ve also stolen a Quasar before have my opponent made it under Maxx C. It’s times like this I side out two Double Summons, so that if I Maxx “C” then I can use as many of the cards in my hand as possible. I’ve also calculated that if you Maxx “C” in response to Genex Birdman’s effect summon when Karakuri Geargia are going off, there is about a 95% chance of getting at least one of the three between Gorz or Trag to stop the OTK. You then can steal their monsters with Trag, and make a lot of different plays. Drawing useless Gadgets is the obvious and well-known problem. Let’s start by putting this in perspective though: with a forty card deck, having no Duality’s or Upstart Goblins to throw things off and rounding by 1%, about 20% of the time you’ll open zero Gadgets, one Gadget about 40% of the time, two Gadgets 30% of the time, and for three or more you get the remaining 10% (specifically, about 9.5%, 1.5% and then .1% and 0.00% for 3, 4, 5 and 6). That means that you’ll open 3 or more gadgets both games one and two about 1% of the time, and for a three-game match, you’ll open three Gadgets about 2.8% of the time. Now this doesn’t include your 7th draw, because I didn’t want to account for all the different ways the deck could get thinned first. But I think this stats are pretty reassuring, especially considering that just as likely as you are to get at least one Gadget, back row before factoring in opposing player interruptions, you’re just as likely to be able to get a Gearframe search of Fortress to mitigate those extra Gadgets. Another problem with this build is that on occasion you’ll open two or three of the big Machinas but no Fortress or Gearframe. At times like this, I try extremely hard to make Lavalval Chain and dump a Fortress. This is slow, and any good deck that draws OK will outpace that. It’s also a problem if they can solve Fortress once you drop it. I’ve thought about dropping the big Machina (Cannon, Force) count, but spamming Fortress in this build is essential since the extra deck is for engine and problem solving. There are some obvious side deck vulnerabilities as well. Thunder King Rai Oh, though there’s Gigantes, Book of Moon, and Dark Hole, is really, really annoying. Luckily though it’s limited and it’s more devastating if they open it than if they get it later. Mistake, the continuous trap, hurts. There are plenty of cards to side if you’re concerned about face up continuous traps though, so I side appropriately. Skill Drain is a similar problem, although Gigantes often solves it quite well. Kaiser Colosseum stop the rank 4 plays pretty hard, although if you can successfully summon Machina Fortress you can often sit on it for quite a long time. Leo, the level ten synchro, is a huge problem, as is Felgrand. I’ve thought about putting Limiter Removal back in the deck, but see both infrequently enough that I haven’t done it. Geargia Karakuri – Maxx “C” hurts them so bad, especially being able to drop Trag. I have had very little problem with this. Plus One Fist – I haven’t seen much of it since Wolfbark went to one, but it was a problem match up. You can’t fearlessly summon a Gadget, Trag and Gorz aren’t very helpful, and while other decks have a problem with the Exceed spam every turn, they just popped it! So annoying. I’ve heard people talk about Call of the Haunted replacing Wolfbark. I won’t go into why, but that doesn’t scare me at all. Bujins – Played well, I can get over them most of the time, though it’s somewhat difficult. This deck can play around though by things such as Blackship of Corn if they just have Hare, Diamond Dire Wolf if they just dumped Turtle, since they’ll have to burn Turtle and one of Crane or Honest to keep Yamato, plus sides like Mind Control and Creature Swap can hurt them. Fortress is also a huge problem for them, of course. This match up also got a lot easier when I realized a certain Ally of Justice monster is searchable with Gear Gigant X…. Hieratics – Pretty much the same as Karakuri Geargia. They take a few turns to set up, and I just find that I can stop their OTK by then most of the time. Pure Gearia – Harder than the Karakuri version. This deck can grind through traps pretty well, but if they open Armor and two three good traps, it’s very very difficult to keep up with them. Harpies – Very easy match up. All the hand traps really hurt them, I’m not afraid of Hunting Ground, Abyss Dweller occasionally hits their engine hard, and the problem really is that if you just stop one of their plays, or get a +1 with Maxx they’re in trouble. Dragons – A tough match up because of Skill Drain. They just have so much draw power, and they can become aggressive very quickly. Getting Redox quickly, as a defense, is essential. Blackwings – Gigantes really, really hurts them. Fortress is a pretty big problem as well. If you focus on controlling only a single monster at a time, you can make their Icarus’s virtual dead. Not too problematic. Constellars – Lacking a monster engine, they just can’t keep up. Omega doesn’t help them much here obvious, and Pleides doesn’t handle Fortress well. Royal Decree also tends to present a tremendous problem for them. Evilswarm – Similar to Constellars, with the obvious problem that Ophion can be problematic. Decree is again really helpful, and the rank 4 plays tend to be good enough. If you drop Fortress before they have Ophion, that’s a tremendous problem for them as well. Mermails – Again, running no back row helps a lot since they don’t get pluses off of Marksman. This is another match up where Mind Control is wonderful, and Trag can steal level 4 or 7. Trag can get around Gaios as well if you have 5 or more cards in hand, since you can simply copy a level 4 in grave to hit Gaios. Abyss Dweller and Blackship of Corn also hit this deck pretty hard. Infernity – I never see the synchro version anymore, so I can’t say about that. But the exceed version isn’t very scary, especially with Barrier to one. The hand traps tend to hurt a lot, and a defense mode Maestroke is a problem for them. And again, I have some nice sides. Windups – Again, hand traps hurt them quite bad, but they can be rough if they get factory and a good trap or two. I’ve tried a lot of different things in this deck, and considered others. I’ll record here some of the things I decided against at various points. 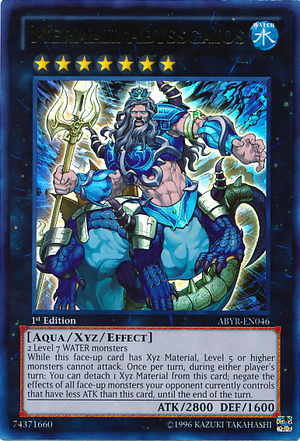 Reptile Support – Kagetokage and King of Feral Imps are some cards people have seen in Gadgets before. I’ve found that Gigantes, Double Summon and Tin Goldfish are all preferable. Gigantes is good by itself and is inherent, Double Summon isn’t a special summon and thins the deck, and Tin Goldfish is a machine, so you can make Gear Gigant X and then search Gearframe. The one big advantage of Kagetokage is that unlike Tin Goldfish, Veiler, Fiendish and Skill Drain don’t stop you from making a rank 4. I haven’t found this to be enough of an issue though. People also mention Masked Chameleon. While it’s a good card, and synergizes with Machina Gearframe, it’s too balanced – you can’t derp with it. I also don’t want to be reliant on getting Gearframe into the grave to make it. Chaos – you can use the reptile stuff, as well as Mandragora, to run cards like Chaos Sorcerer and Black Luster Soldier… if you have some way of consistently getting lights in the grave. Veiler isn’t good enough, and Utopia isn’t worth running for this. I tried to create a build, and it looks so bad I never even really tried it. Though it was fun when I Big Eye’d BLS in someone else’s Chaos Gadgets build. Salvage – back when I ran back row and just Tin Goldfish, I tried out Salvage to get them back. It was pretty cool. I might try it if I used Gear Gigant X but not Machina engine, since you’d be focusing on Tin Goldfish and rank 4 plays. In this build it isn’t viable, and I don’t think it’s powerful enough to justify what is sometimes a very terrible card to have in hand. Photon Thrasher – just a big level 4 I used before I realized Gigantes is better. Also a light, for Chaos, though I never tried it. 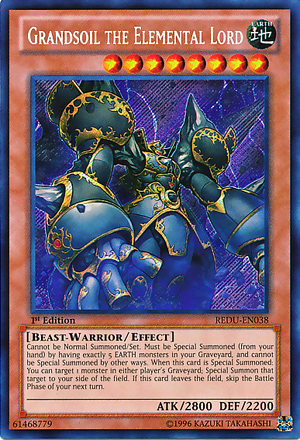 Dust Knight – It’s a level 4, 1400/1200 ATK/DEF who has a flip effect to send any EARTH monster from the deck to the grave. I thought it’d be good with Fortress and Redox, but it’s way too slow, I’d always rather summon other things, and just generally not good. I was really excited about it for a bit though. Grandsoil the Elemental Lord – I got some serious derp out of this card. With triple Gigantes and triple Redox, it was somewhat consistent… though I took it out even before Redox went to one. The problem was that if you didn’t win that turn, when your opponent got rid of it, you were pretty SOL. Didn’t like it. Naturia Cherries – I tried it with Grandsoil too, and it was cute when my opponent had to deal with more of those annoying suckers. Plus having more tuners was nice. But oh my god, I hated drawing two. Just no. Never again. Unfettered Draw Power – I’m talking Cardcar D, Upstart Goblin, Reckless Greed, and even Trade In here (for Machina Cannon!). You can critique these separately, but there’s one basic problem… what are you drawing? The slow, consistent pluses of thinning the Gadgets is great because then you don’t draw so many Gadgets. If you use all these other draw cards, you’ll draw more useless Gadgets, and for what? Being able to make another rank 4? Not necessary. 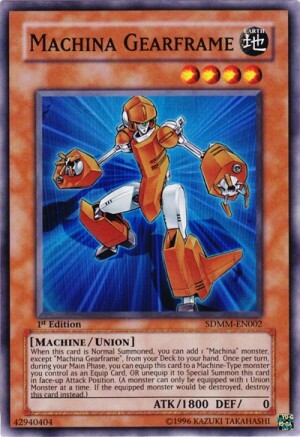 I don’t care that Cardcard D is searchable with Gear Gigant X, there’s a good reason that Geargia don’t run it! Tour Guide – the extra deck is too tight, it’s way, way not worth sacrificing rank 4 consistency. 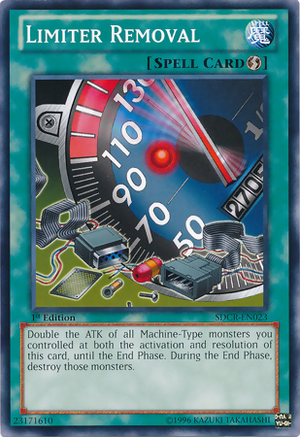 Limiter Removal – I loved this card when I ran it. I want to point out right away that if it enables you to hit over just one monster that you otherwise wouldn’t have been able to, you mitigate what otherwise would be a -1. 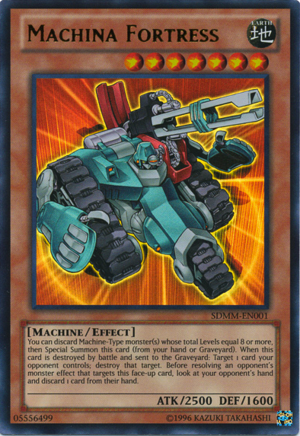 And Gearframe with any other machine in hand becomes an OTK, two gadgets hitting into an empty field with it is ~5000 damage, Gearframe can hit over Leo and Felgrand, Fortress can hit over… just about anything, and you can save a monster like Fortress or Gear Gigant X after using it by using Gearframe’s Union effect. But occasionally, I’d have to -1 off it by hitting over just one monster and then not exceeding. When I was making choices, it just had to go. Gem Knight Pearl – I just rarely need it as a beater. When I was making choices, something had to come out, and it did. Number 85: Crazy Box – This card is mostly here because it was nice against Skill Drain. I found though that most decks that run Skill Drain run a bunch of back row too, and Crazy Box can’t handle it. It had just been better to side hard against it, and use my primary engine and problem solvers. Gagaga Cowboy – Situationally, we all know you can push for game with this card. And there are definitely times I wish I’d had it. But whenever I used it to hit over a monster, I was so unhappy about it, but it always died so easily! Just didn’t seem worth keeping in. In terms of beaters, I’d prefer Pearl over it, I think. Fairy King Albverdich – You can make this card relatively consistently, but I just found that double Honor ARK seemed to be a better choice. It was better in Chaos Dragons days. Might make a comeback at some point. Master of Blades – I thought, hey, it’s big, it’s EARTH, and Inzektors are rough, right? The first time I made it, it was against Inzektors, and they just equiped Gigamantis to Centipede, then Hornet, and… hit over. I thought it would be good against Fire Fist too, but I found they could too often use Tiger King to negate it and then pop it with Bear. Basically, it’s not much better than just having Redox and Fortress on the field. 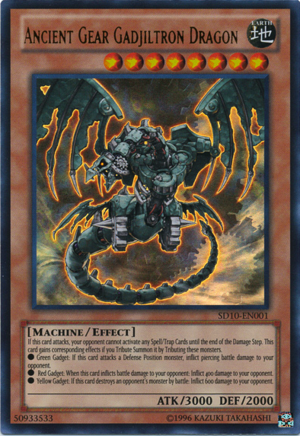 Gaia Dragon, the Thunder Charger – I used to use Ancient Gear Gadjiltron Dragon back when Ultimate Offering was legal, and because of that I know the power of piercing. I’ve seriously considered running this third rank 7, also possibly because I may or may not run Mind Control which synergizes with this. I couldn’t justify taking out any rank 4s. 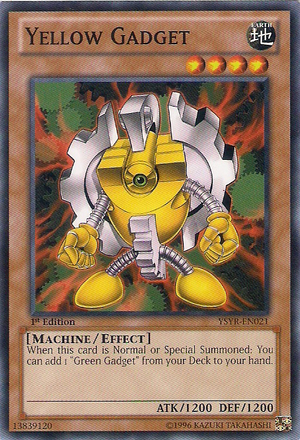 Geargiauger – I know this isn’t TCG yet, but I thought about it because of Gearframe. I might run it in a back row build, but in this build, it would just be terrible unless you had it first turn. It’s just too balanced of a card. 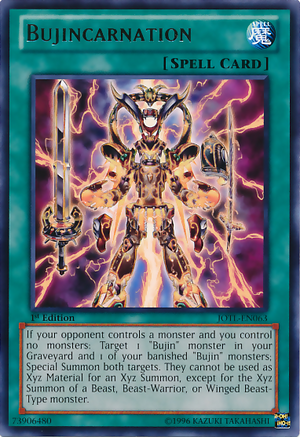 Number 104: Masquerade – I saw Dubkdad use this against Bujins in… thunder family maybe? I can’t remember, but it looked awesome, and I tried it for a while. While it’s great when you’re afraid of Honest, I just found that other answers were usually better, namely Blackship of Corn and Maestroke. They require less commitment as well. Number 69: Heraldry Crest – If the negation was a condition instead of a trigger, I would love this card. It’s cool that it can be used to copy my own monsters, but it took too much commitment and typically if it was worth making I was winning anyway. It was better to put problem solvers in. Rank-up Cards: None of the Exceeds I could run are good enough to justify both the extra deck space and main deck space. It’s really about putting all your eggs in one basket. I just wasn’t comfortable with it. 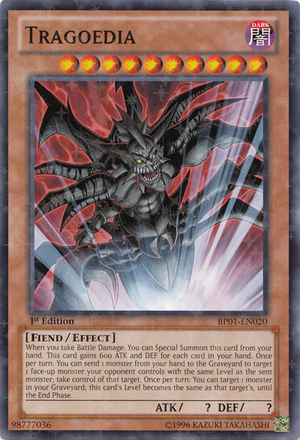 Chain Summoning – There was a gadget deck that used this and topped. It obviously works mostly with Kagetokage, which I already discussed I don’t prefer. But really the reason that guy topped was that Plus One Fist has a really tough time with two monsters. That was mostly it. This card is often dead, it involves a great deal of field commitment, and is just too vulnerable. Scrap Recycler with Transmodify – Haven’t gotten a good build with this yet, but hope for it for one day! 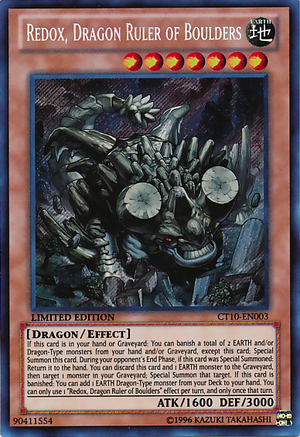 Ancient Gear Gadjiltron Dragon [Honorable Mention] – This card isn’t really viable in this deck, but there was a time I used Magical Hats and Geartown to spam this sucker. 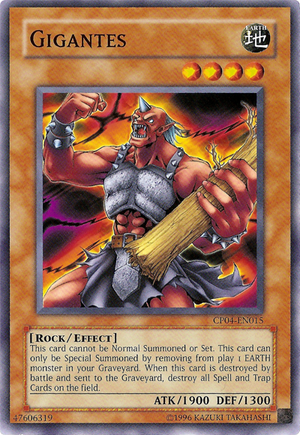 With Ultimate Offering at three, I could tribute summon this guy pretty often too. My opponent would hit into a Gadget, I would summon another, and when there was a replay they’d just attack again, confused, then… BAM! Scary guy. I didn’t run the Machina engine back then, maybe there’s some way to build this with with Trade Ins and Machina Cannon. I’m thinking Plaguespreader Zombie to put extra Gadgets back maybe? And then I could synchro into Leo? Just rambling here now. I totally didn’t proof-read this. Maybe I will later All other criticisms are welcome. 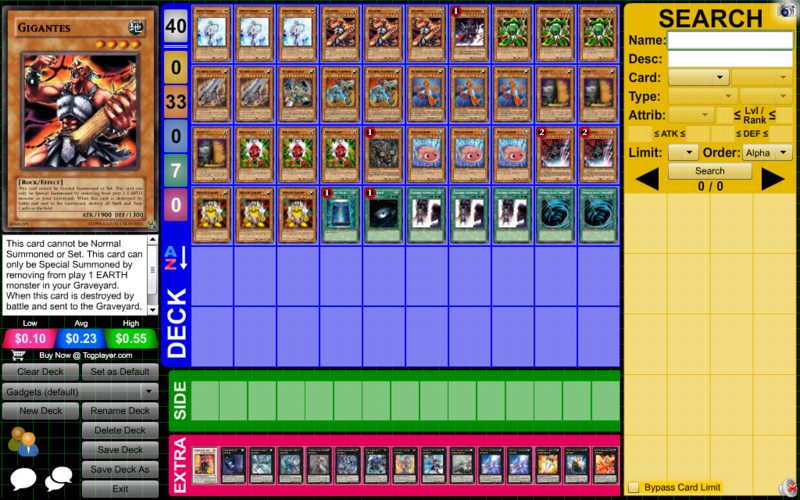 This entry was posted in Data Analysis, Yugioh by Michael Seydel. Bookmark the permalink.